In India, Toyota Kirloskar has just launched a new service that will have the rest of the auto industry taking note. This new service, called “Service Express,” allows all Toyota customers to have their cars serviced right at their doorstep! With the intent of bringing convenience to Toyota drivers in remote locations, this new program is also one that strives to emphasize the importance of keeping up with regular vehicle maintenance. There’s a lot more about this new program that people should know, which is why we here at Westbury Toyota have decided to break it down and share all the important details. 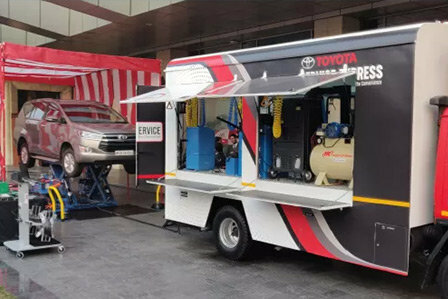 Before now, Toyota already had mobile service vans operating in various parts of India. However, the solutions offered by these vans are fairly basic and encompass only minor repairs, towing, and basic services in the event of a breakdown. With Service Express, Toyota is providing the customer with all of that and more, including any scheduled maintenance for their vehicle, regardless of whether it’s a small, medium, or large job. Customers using Service Express can also benefit from wheel balancing and alignments and an eco-friendly car wash and what’s more, says Ninad Ambre of Carwale, all services offered by this program will be performed by a team of specially trained mechanics. In addition, future plans for Service Express will bring minor body-paint jobs and repairs as well as a beautification service. For those who can’t find the time during the day to have their car attended by Service Express, there’s also a “night service” facility available, reports Abhinand Venugopal of Drive Spark. Toyota customers can take their vehicle there to have it serviced overnight, eliminating the problem of sacrificing valuable drive time during the day. As of right now, Service Express is only operational in the remote parts of Rajasthan. Despite the limited location, the feedback coming in for Service Express has been overwhelmingly positive, paving the way for Toyota to expand this initiative in order to better provide customers in rural and remote areas the service they require. It removes the stress and complications of people having to drive hours in order to get their cars properly maintained or repaired, and at the same time allows them to enjoy reasonable pricing. As noted by Financial Express, the Deputy Managing Director of Toyota Kirloskar Motor, N. Raja, explained that one of the primary driving forces behind Service Express was to raise awareness on the importance of routine car maintenance in order to guarantee a safer and more reliable driving experience. Not only does this initiative offer previously unavailable convenience to people living in the remote parts of India, it’s also a way for Toyota to show its gratitude to the many loyal customers its gathered over the years. - N. Raja, Deputy Managing Director, Toyota Kirloskar Motor. Service Express focuses on giving drivers the most convenient car maintenance and repair option currently available in India. In doing so, the company is proving once again their commitment to ensuring that every Toyota customer is able to partake in a driving experience that is dependable and as safe as it can possibly be. While Service Express is currently limited to a select area of India, given the warm reception it has received, it’s only reasonable to assume that it will eventually be a mainstay of the exemplary customer experience for happy Toyota owners across the globe.